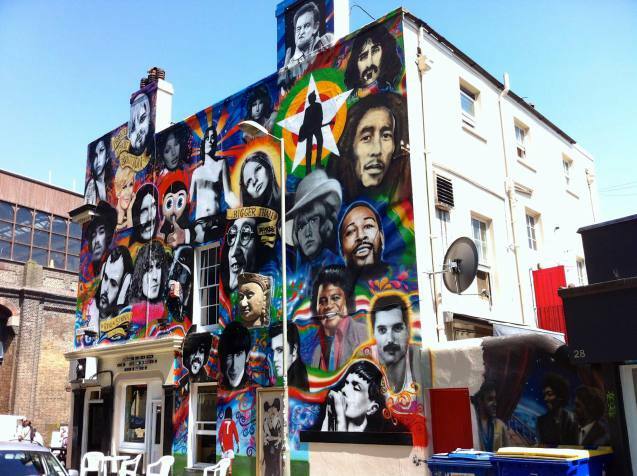 Last summer, Sinna One and REQ repainted the whole side of The Prince Albert pub in Brighton with 30 portraits of dead rock stars. This is a celebration of the completion of the mural and an opportunity for art lovers to own a portrait by these 2 artists – also to launch a range of prints of the mural itself. The preview night 21st February and the Art Schism gallery opens at 5pm until 8pm. There shall be an after party at the Prince Albert from 8pm onwards. via EVENTS – art schism. This entry was posted on February 19, 2014 by mptask in Art Schism, Brighton, February 2014, Street Art and tagged art, art exhibition, Art Schism, brighton, mural, Prince Albert pub, Req, Sinna One, street art.